Disable the two relay pylons, reach the satellite, and warn the UNSC Infinity. Halopedia has a walkthrough guide to this level, Forerunner (level). See Forerunner (level)/Walkthrough. Forerunner is the fourth campaign level of Halo 4, and the third one with actual gameplay. Completing the level earns the player the "Forerunner" achievement, worth 10 Gamerscore points. The level-exclusive achievement "This is my Rifle, this is my Gun" is awarded for carrying a UNSC weapon all the way through the level on Heroic or Legendary, worth 20 Gamerscore points. In Halo: The Master Chief Collection, "Forerunner" and "This is my Rifle, this is my Gun", unlockable with the same respective criteria, are now worth 10 Gamerscore points. "Lord of Admirals", worth 5 Gamerscore points, is awarded for finding and accessing the terminal in the level. Beating the level's 20 minute par time and 22,000 point par score unlocks "Raging in the Dark" and "Shadow of Sundered Star", respectively, each worth 10 Gamerscore points. 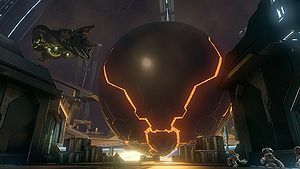 The level is mainly set in a rocky region under the habitable surface of the shield world Requiem, as well as a series of Forerunner structures, including two relay pylons and a satellite station inside the shell enveloping the shield world. The prototype UNSC warship UNSC Infinity has arrived near Requiem to investigate Cortana's distress beacon, and the Master Chief must disable two beam towers that are causing communications interference preventing Cortana from contacting the Infinity in order to warn the ship about Requiem's defenses. During the level, the player faces opposition from both the Prometheans occupying the shield world as well as Covenant remnant forces. The assault on the first pylon primarily involves combat on foot, while the second one is more vehicle-focused. 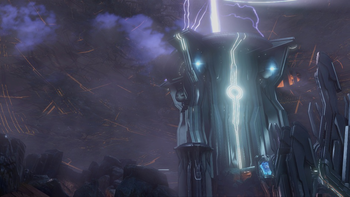 After deactivating the second beam tower, the Chief uses a series of translocation portals to reach what Cortana assumes to be a relay satellite, while Covenant remnant warships converge on the same location; instead of a communications relay, however, the satellite turns out to house a Cryptum. The finale of the level introduces the primary antagonist of the game, the Promethean leader known as the Didact. The slipspace portal delivers John into a small Forerunner room. Four autosentry units line the walls. John-117: "What were those things?" Cortana: "Some sort of advanced defense AIs. Related to the Sentinels, I'm guessing, but it's hard to say without a closer look. C'mon, let's figure out where that transit system dumped us." John-117 leaves the room and enters a platform inside Requiem's core - a hollow sphere of gigantic proportions. Cortana: "Put me in the console." John approaches a console at the end of the platform and inserts Cortana's data crystal chip into it. John and Cortana observes the area. A distant purple sphere hovers in an otherwise empty expanse, with two energy beams anchoring it to the core's inner surface. Cortana: "This is Requiem's core, all right, but Infinity is definitely not here." Cortana brings up a holographic panel in front of her. Cortana: "That satellite in the center is amplifying the ship's broadcasts like a relay." John-117: "Maybe we can use it to respond." Cortana access several other options on the screen. Cortana: "Those beams coming off of it are creating the interference we've been experiencing. We'd have to take them out to contact Infinity." John-117: "Can you get us there?" Cortana presses a final prompt, opening a nearby translocation portal. Cortana: "Opening a gate to the first beam pylon. Pull me, and let's go." 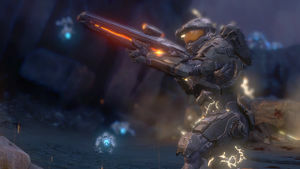 John retrieves Cortana from the terminal and readies his rifle. John enters the portal and arrives at a small hallway. John-117: "This is the first pylon?" The Chief exits into a tight canyon. A schematic is displayed on his HUD, showing the path to the pylon. Cortana: "Negative, this is as close as I could get us. Hope you don't mind hoofing it a little." The first pylon, looming over the cliffs. The Chief exits into a small valley, where mechanical quadrupeds are crawling over the rocks. The nearby skyline is dominated by the pylon. The automatons hastily retreat as John approaches. He continues on, encountering more of them in the next valley. Cortana: "And they're back! Coming down the walls!" John quickly defeats the Crawlers and resumes his journey. John-117: "Those weren't the same things we saw in the Terminus." Cortana: "Similar cortical footprints as the tower AIs... They're connected, all right." John activates a hard light bridge. Crossing the bridge, he enters another valley. John looks up just in time to see a Promethean Knight crashing down from above. The Knight knocks John on the ground, emptying his shields, and screams; its faceplate splits open, revealing a glowing blue skull that is disturbingly human. John punches the Knight's head and then kicks its abdomen, knocking the machine off him. Snarling, the Knight quickly teleports away. Cortana: "Well he's just a ray of sunshine, isn't he?" Cortana: "From that peek under the hood, I'd say these constructs must be mimetic in nature." Multiple Knights observe the Chief's progress from the cliffs. John arrives at a cliff edge. Knights are seen phasing away from the opposite rocks. Cortana: "Similar phasing activity at the edge of our sensors. We're about to get busy!" John enters another small valley. A Knight teleports into the area as Crawlers come into view. The Knight releases a Promethean Watcher from its back and attacks the Chief, as several other Knights observe from atop the canyon. John eventually eliminates all hostiles, causing the observing Knights to teleport away. The Chief enters a doorway on the far side of the valley, which leads into a hallway stocked with Forerunner ordnance. Cortana: "I've discovered something interesting about our new friends. When the big ones explode, that momentary flash we're seeing is actually a data purge." A schematic of a Knight is displayed. As the Knight dissolves, a data stream is extracted and translated by Cortana. John-117: "Can you tap into it?" Cortana: "So far, I've pulled multiple strings referring to the big ones as "Promethean Knights". Beyond that, though, things get a bit dense." The Chief exits into a large cavern, disposing of more Knights and Crawlers along the way. As he approaches a raised platform, he picks up a garbled transmission from Captain Del Rio over the COM. Cortana: "The relay interference is increasing. We must be getting close to the pylon." More Prometheans occupy the area below. After wiping out the opposition, John's HUD is distorted by purple static. Cortana: "...that's me. Something about moving through those portals is increasing the load on my systems." John-117: "Are you...going to be alright?" Cortana: "Don't worry. I've held off rampancy this long, haven't I?" Cortana: "Chief, we won't be able to contact Infinity if we don't get to that pylon and take it down." Armed with a lightrifle, the unshielded Chief engages a pack of Crawlers. On the far side of the depression is a rocky path, which leads up to the exit; the second terminal lies below this path. After traversing another tunnel, John finally arrives at the pylon. The walkway leading to the top is blocked by hardlight shields. Cortana: "That's the target, but it looks like the entrance is shielded. Let's figure out how to take it down." John explores the area, engaging more Prometheans, and eventually finds an energy sphere in one of the smaller structures. Cortana: "One of the shield's power cores. Take it out!" Cortana: "I read two more cores on our level. Hit them before you climb all the way up." John continues on and destroys the second core in another structure. Cortana: "Well done, Chief! One to go." John destroys the last core. Cortana: "Great, that's all the cores. Head for the top of the pylon." John heads up the main structure. Two more Knights phase in to block the pylon entrance, but are quickly defeated. Cortana: "Chief, look at this:"
A schematic is displayed as another garbled transmission from Del Rio plays in the background, displaying the Infinity approaching Requiem's entrance portal. Cortana: "That's Requiem! They're not inside at all...they're moving into orbit." John enters an elevator, which starts up to the top of the pylon. Captain Andrew Del Rio (Video COM): (garbled) "This is Captain Andrew Del Rio, hailing any survivors of the UNSC Forward Unto Dawn; we're approaching your last known location." The video feed is briefly superimposed by the same orange glyph encountered at the Cartographer. John-117: "Did he say Forward Unto Dawn?" Cortana: "They must have intercepted our distress beacon!" John-117: "The beacon was pulled into Requiem with us. If they try to follow it..."
Cortana: "...they'll get caught in the gravity well. I'll keep trying to warn them; you just get that beam down!" The elevator stops and the doors open. A rotating mechanism is projecting the energy beam into the distant satellite. A small console stands directly in front of the beam emitter. Cortana: "That's the beam control!" John pulls out a metal shaft inside the console, reorient it to a horizontal position, then slams the cylinder back in. The beam emitter deactivates and retracts into the floor. Cortana: "It's working. The signal from the relay is starting to clear up." Del Rio (COM): "FLEETCOM Actual, we've detected a UNSC beacon coming from somewhere inside the planet-"
John-117: "They haven't hit the gravity well yet." A portal activates on the far side of the chamber. Cortana: "There's still too much interference to warn them. We've got to disable that other beam before they're pulled in like we were." John is returned to his starting point. With the first pylon disabled, only half of the energy field surrounding the satellite remains active. As the Chief approaches the console, three CRS-class light cruisers and their Phantom escorts drop out of slipspace inside the core. They rapidly close in on the second pylon. Two Watchers protecting a Knight Battlewagon. Cortana: "I was wondering why Infinity hadn't encountered the Covenant yet." John-117: "What are they doing here?" Cortana: "They're heading to the second pylon as well!" John-117: "That can't be a coincidence." Cortana activates a second portal, transporting John to a small cavern. Another schematic is displayed, showing the path to the pylon. Cortana: "Sounds like the Prometheans don't want the Covenant here, either. The battlenet's already lighting up with reports of resistance all around the pylon." John drops down an opening in the rocks and arrives in a large valley. One of the light cruisers moves into position, dispensing drop pods into the area. Covenant troops leave the pod and immediately engage patrolling Prometheans. John moves up to a raised path on the opposite side of the valley. A Promethean Knight phases in behind a Sangheili and stabs him in the back. John eliminates the Knight and moves on. A group of Watchers enters the area; one of them generates a Forerunner beam turret, which opens fire on both the Chief and Covenant infantry. After dispatching all hostiles in the valley, John enters the adjacent valley. Two Ghosts speed past John, but a Knight swiftly cuts down both drivers with its blade. After killing the Knight, John boards one of the Ghosts and speeds through the valley, past Covenant and Promethean infantry battling for control. Another unintelligible transmission from Del Rio is received just before John reaches the exit tunnel. Cortana: "The relay's signal is breaking up again. We're almost to the beam." The garbled video feed switches to a diagram, showing the Infinity moving into Requiem's open entrance portal. Cortana: "They've found the opening! We better get up to that relay, and fast!" The second pylon, occupied by Covenant troops. John arrives at the second pylon. The area is occupied by Covenant infantry, supported by Banshees and Ghosts. John finds the first power core and disables it, liquidating the opposition along the way. Cortana: "Power core down. Shield's weak, but still online. Take out the other two power cores and we can access the pylon." John moves on to destroy the second power core. Cortana: "Second power core offline. Good job, Chief!" John disables the final power core. Cortana: "That'll do it. Shields should be down. Get up to that beam!" 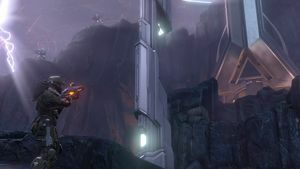 John reaches the top of the main structure, battling past several Sangheili and enters the elevator. Del Rio (Video COM): "UNSC Infinity to survivor, Forward Unto Dawn. Reading a faint IFF tag near the planetary core, do you read?" Cortana: "The planet's core? They know we're here! Infinity, this is UNSC AI Cortana. Do not approach Forerunner planet! Repeat, do not approach-"
Del Rio (Video COM): "Infinity to UNSC asset! Forward Unto Dawn! We read you, but you're breaking up! Helm, increase speed by point-seven. Get us in there." Cortana: "Negative, Infinity! Do not enter the planet!" Del Rio (Video COM): "If you can hear us, keep transmitting." Cortana: "No! Chief, you've got to get that beam down now!" The elevator stops, and John emerges into the emitter chamber. John deactivates the second pylon, using the same method as the first. Cortana: "Cortana to Infinity, do you copy? Come in, Infinity! The interference is gone, but your suit's transmitter's not strong enough." John-117: "Route us up to the relay satellite." A portal appears at the end of the chamber. John heads in and phases back to the starting point. With both pylons disabled, the energy field surrounding the satellite is now completely gone. A large portal activates on the far side of the platform. Cortana: "Once we're on the satellite, there's bound to be a central control point." Covenant light cruisers depart from the second pylon and reverse towards the satellite. John-117: "The Covenant are moving towards the relay, too." Cortana: "This doesn't make any sense! Why would they care about a broadcast relay?" John-117: "I'll handle them; you just find us that control node." John enters the portal and is brought to the satellite. The central chamber is dominated by an ominous grey sphere, engraved with orange patterns. A Phantom arrives and drops off an Unggoy lance, with one Kig-Yar Sniper. They are quickly disposed of. John-117: "How soon 'til Infinity hits the gravity well?" Cortana: "A minute or two, max! The Covenant are making a push for something on the far side of the satellite." John-117: "Is that the signal relay?" Cortana: "Yes. Now we just have to hope we can use it to warn Infinity before it's too late!" Two doorways lie opposite each other, leading to opposite sides of the chamber. John can enter either; on the left side, the Prometheans are using their superior weapons to keep the Covenant intruders at bay. On the right side, Promethean forces are being forced back by the numerically superior Covenant. The Chief advances through the chaos, eventually reaching a walkway leading up to the orb. Cortana: "Chief, you need to hear this!" Infinity Communications (COM): "We're detecting a slight gravimetric disturbance near the planetary entrance. Suggest altering approach vector: 43K-750K-12K." Cortana: "They're not diverting from the opening! Hurry, Chief!" John arrives at the far side of the satellite, where several Sangheili are combating Promethean Knights. He quickly eliminates the last hostiles in the area. Two small pillars imprinted with the Reclaimer symbol stand on the far end of the walkway. Cortana: "Wait! Something's not right-"
John-117: "We don't have time!" Cortana: "The pillars! Touch the pillars!" The Cryptum's occupant is set free after a hundred thousand years of slumber. John places his hands on each pillar. John-117: "Infinity! This is Sierra-117 of the UNSC Forward Unto Dawn. Do you copy?" John's own speech is distorted and amplified back at him. The sphere slowly rises, emanating an orange glow. John stares at it in confusion. John-117: "Infinity? Do you read?" Again, John's words are distorted and amplified back to him. The sphere continues to rise, its black plating folding away to reveal a glowing orange core. Below the Chief, both Covenant and Promethean forces cease fighting and look upwards as the Cryptum is set free. Cortana: "Chief...Chief, let go of the contacts!" John quickly pulls his hands away from the pillars, proceeding to ready his assault rifle. John-117: "Find us an exit." Cortana: "Don't wait around on my account..."
John leaps off the platform just as the Cryptum releases an orange energy wave, knocking the Covenant and Prometheans off their feet. John takes cover behind a small barrier, peeking over to observe the sphere. A small triangular capsule lowers itself out of the Cryptum's bottom opening. The capsule opens up to reveal a kneeling humanoid figure. Upon seeing him, John ducks back behind the barrier. The figure stands up and flexes his muscles. His customized combat skin assembles itself around him. Once fully armored, the figure assesses his surroundings. Ur-Didact: "So fades the great harvest of my betrayal." The Ur-Didact waves his hand, creating a shimmering wave over the nearby Prometheans; their blue highlights turn orange, signifying his control over them. The Sangheili bow down in reverence of their living god. The Ur-Didact's platform floats toward the Chief's position. He looks at John disdainfully. Ur-Didact: "Even these beasts recognized what you were oblivious to, human. Your nobility has blinded you...as ever." The metal barrier shielding John disintegrates. John immediately raises his rifle, but the Forerunner simply reaches out and telekinetically binds him. The helpless John is lifted to face the Didact. Ur-Didact: "The Librarian left little to chance, didn't she? Turning my own guardians - my own world - against me. "(looks down at the Prometheans, then looks back at John) "But what hubris to believe she could protect her pets from me forever. If you haven't mastered even these primitives (looks down at the Sangheili), then Man has not attained the Mantle. Your ascendance may yet be prevented." The Ur-Didact pulls John in closer. Ur-Didact: "Time was your ally, human. But now it has abandoned you. The Forerunners... have returned." The Chief is rendered helpless by the Didact's constraint field. The Ur-Didact summons his helmet, which assembles itself to resemble a glowing metal skull. John struggles futilely against his grip. Ur-Didact: "This tomb...is now yours." The Ur-Didact tosses John away, slamming him against a wall. He crashes onto the floor. The Spartan groans and forces himself back up, seeing the Ur-Didact retreat back into the rising Cryptum, now surrounded by swirling energy. Cortana: "Slipspace rupture! Chief, move!" John runs for his life. The Cryptum's energy glows increasingly bright, then explodes with a blinding flash. Cut to black. Cortana: "Chief, please! We've got to go!" Fade in to John's HUD, slowly coming to. He's back in the canyon. Cortana: "That...Didact. He manipulated Infinity's signal to get us to release him! Get up!" John regains full consciousness and quickly forces himself up. John looks up to see a swirling energy field forming above him. A light cruiser is sucked into the breach, alongside masses of debris. Cortana: "Moving the satellite into slipspace destabilized the core." A nearby Phantom is pulled into the field as well, smashing into another Phantom in the process. Both crash into the canyon walls, their Ghost complement spilling out ahead of the Chief. Cortana: "The Didact's leaving! We've got to find a portal out of here before the whole network collapses!" John heads to the Phantom's crash site. All of the Ghosts are still intact. Cortana: "Grab one of those Ghosts!" John boards the Ghost and begins to drive down the valley. Cortana: "Hang on, I'm going to channel energy from your shields to overdrive the Ghost's boost." John's energy shields are depleted, but his Ghost can boost faster and indefinitely. He charges down the valley. Cortana: "Chief, what are you doing?" Another Phantom crashes into the canyon. Cortana: "Keep going! Keep going!" John encounters numerous Unggoy running for their lives. He speeds past them. The canyon is rapidly disintegrating around John as the gravity well grows stronger, sucking chunks of rock upwards. As he enters a cave, Cortana picks up another transmission from Del Rio. Cortana: "Emergency broadcast from Infinity!" Del Rio (COM): "FLEETCOM, this is Infinity. We are encountering an unidentifiable gravimetric disturbance and are being pulled inside a planet of Forerunner origin! Possible contact with the UNSC Forward Unto Dawn! Jettisoning complete log beacons at our last known!" John-117: "Cortana, we need to get up there." Cortana: "It's not like I can get out and push!" John advances through the imploding caves, chasms and valleys, passing by more fleeing Unggoy along the way. Cortana: "The core's not going to last much longer!" John drives over a chasm, revealing a large portal up ahead. The Ghost enters the portal. The Infinity emerges inside Requiem. A portal opens near a rocky cliff, spitting out John's Ghost. The edge of the cliff is rapidly approaching. John quickly vaults on top of the Ghost, then kick-jumps off of it, coming to a stop inches from the edge. The Ghost plummets into the fog below and explodes. 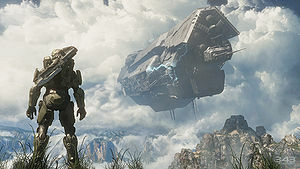 John looks up and sees the massive UNSC Infinity emerging from the clouds, electricity sparkling around the hull. The ship leaves the cloud layer and draws closer to the Chief. Del Rio (COM): "Mayday! Mayday! This is the captain of the UNSC Infinity. Unknown entity has seized control of our ship! We're without power, and on a collision course with an unidentified Forerunner planet!" The Infinity speeds past the Chief's position and descends into the jungles ahead. The Cryptum towers over the Master Chief. Cortana: "Marking. Impact predicted 77.8 kilometers due north." John watches as the Infinity descends. The air begins to waver and distort behind him as the Cryptum rises from below the cliff edge. John quickly turns back and readies his assault rifle in alarm. The Cryptum sends out a scanning pulse, then zooms away to the Infinity at supersonic speed. Cortana: "You know where he's heading..."
John-117: "Same place we are." John walks directly toward the camera. Cut to black. Level ends. A Legendary-only easter egg allows the player to spawn nine Incineration Cannons in the mission. Another Legendary-only easter egg allows the player to spawn two hidden weapons caches, one with Incineration Cannons and another with Binary Rifles, near the Cryptum. During the final segment of the mission, the player can occasionally cause a glitch in the game by ramming a rock with a boosting Ghost right as the rock juts into the air. This will launch the Ghost and the player up into the air and out of the map, where they will continue to fall below the map for several seconds before the game reverts to last checkpoint. Sometimes, during the Ghost segment, John-117's shields will not be drained and diverted to the Ghost's engines. If this happens, sometimes dialogue during this segment will not play. The Covenant ships that slip inside the core take a substantial amount of time moving to the second pylon and satellite, but when you go through the teleporters, they are much closer. During the cutscene where the Didact is freed, the two Elites besides the Promethean Knights are both shown with energy swords. In a later shot, one of the Elites is shown with a Needler instead. In the final cutscene, Captain Andrew Del Rio states that the UNSC Infinity is without power. However, the ship's engines are clearly powered up as it passes over the Master Chief. In co-op mode, players who die during the Ghost escape sequence will respawn already riding a new Ghost, to prevent death from making it impossible to finish the level. The animation of the Promethean Knight leaping onto John is changed if the level is played with the Black Eye Skull on. In the alternate animation, it shoots the player after being kicked off to ensure your shields don't recharge from your melee. In the section where the Knight kills the Elite drivers of the Ghosts, the Ghosts to be hovering; also if the player touches them they will fall to the ground as any other vehicle would. 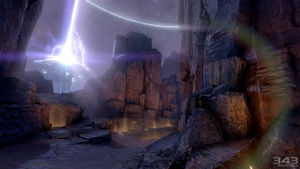 The two paths to the Cryptum on "Almost Home" reverse the battles between the Covenant and Prometheans. On the left path, the Prometheans appear to be winning. On the right path, the Covenant appear to be winning. 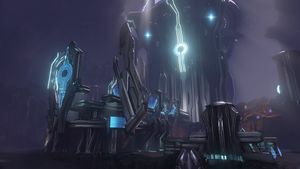 The map profile image for this level can be found under the name "Forerunners" through the Halo Waypoint website, indicating that the title for the level may have originally been plural. During the first playthrough of the level on a given Xbox 360, an extended pickup animation will play for each Forerunner weapon the first time it is acquired. The animations will not appear on subsequent playthroughs unless one clears all Halo 4 data from the console's system cache. The same is true of Cortana's unique dialog regarding the terminal on the level Requiem, as well as the very appearance of terminals throughout the campaign. Early concept art of the level. Finalized concept art of Requiem's core, with the pylons rising out of the cliffs. Early concept art of the pylon. Finalized concept art of a pylon. Concept art of a pylon's beam emitter. Concept art of the Cryptum. Closeup detail view of one of the Forerunner Pylons. The player wielding a lightrifle in first-person. The player facing a Forerunner door in a cavern. First-person view of the player fighting a Promethean Knight and a Watcher. A first-person view of the player observing one of the pylons from a distance. The player near the entrance to one of the pylons. John-117 barely surviving the Ghost crash. John-117, moments before the Infinity arrives inside Requiem. ↑ Xbox 360 Achievements: Halo 4 Campaign Hands-On Preview - The Hardest Halo Yet? Me Thinks So!